The company's Smart InstaView fridge puts Amazon's virtual assistant to work ordering groceries and more. Alongside a load of new TVs, you can count on all the big tech companies to roll out new smart appliances every year at CES. LG is no exception, adding Amazon's Alexa to its line of Smart InstaView refrigerators. 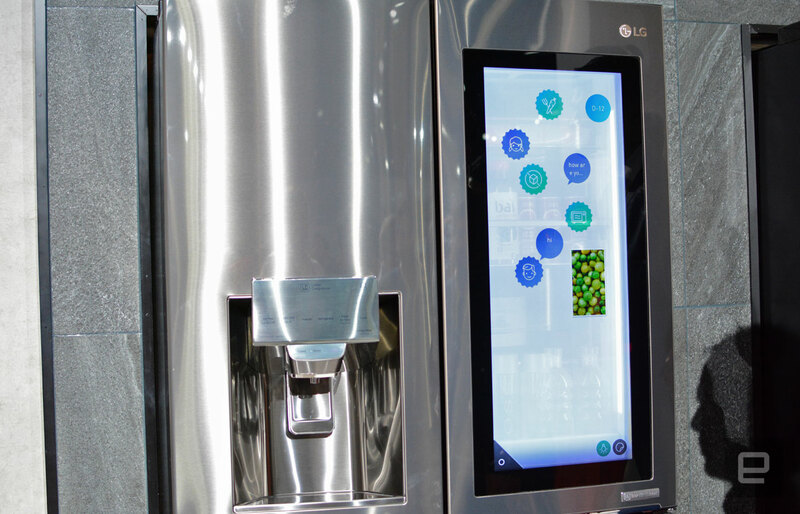 We've seen previous versions of the fridge with huge touchscreens in the door, but this time around the company has tacked on a virtual assistant and webOS software in the US. For the global model, expect Windows 10 integration and access to Cortana for spoken assistance. The kitchen is one of many places Alexa is popping up in new devices at CES, but it's a place where the virtual assistant has the potential to be especially helpful. In addition to the usual tasks like news and weather updates, it can lend a hand with grocery orders. Due to the chaos of LG's booth, I wasn't able to test out the voice interaction, but I was able to tap through the Smart InstaView's other features. As you might expect, kitchen tools like recipes are available right on the door of the appliance. There are also cameras inside that allow you to look in on specific compartments from the touch panel. In other words, you can see if you're low on milk, eggs or cheese just by tapping around on the door. The display is also transparent so you can disable it entirely and get an actual view of what's behind the door. You can also knock on the door to take a look inside. Lastly, as you might have guessed, all of this info is accessible on your mobile device of choice. Alexa will play a bigger role in the kitchen this year due to the likes of LG, Whirlpool and others adding support to their new appliances. In terms of LG, the only real downside is cost. One of last year's InstaView models was priced at $4,600, with this year's version unlikely to be cheaper.